Condo de luxe avec 3 Master Suites chacune avec un lit king size et. Pacific Paradise est un condo de luxe magnifiquement meublé et décoré au sixième étage de Vista Las Palmas (VLP), le bâtiment de copropriété le plus exclusif et le plus luxueux de la ville animée de la plage de Jaco. La porte de la piscine de VLP s'ouvre directement sur la plage à quelques mètres de l'océan. Vous et vos amis et votre famille apprécieront les trois suites principales, chacune avec des lits king size et des salles de bains privées. Le grand balcon commande un point vide, une vue panoramique sur l'océan Pacifique et la jolie plage de jaco. Profitez de l'heure du cocktail alors que le coucher du soleil allume l'horizon. Le condominium est équipé de WiFi, Sony LCD, d'une cuisine entièrement équipée et d'une laveuse et sécheuse. Tous les clients bénéficient de l'utilisation gratuite de la grande piscine en bord de mer, du spa et du centre de conditionnement physique climatisé. Le transport économique de l'aéroport international de San Jose prend moins de 90 minutes ou louez une voiture et utilisez le parking couvert de VLP. La propriété est entièrement fermée et offre une sécurité 24 heures sur 24. À pied des magasins, restaurants et la vie nocturne pour laquelle Jaco 'est connu. Cours de surf disponibles juste en face de VLP ou prenez votre conseil d'administration et capturez une vague. Notre concierge vous vérifiera et peut organiser un chef privé, des réservations de restaurants, des soins spa et des massages, du golf de championnat, des aventures ATV, des visites à canopée de Los Suenos, une excursion d'une journée au parc national Manuel Antonio ou pratiquement tout ce que vous pouvez imaginer. Viens et amuse toi! Pura Vida! Fantastic stay in Jaco. Condo was spacious, clean and had all of the amenities we needed. Beautiful view of the beach and sunsets. Location allowed for beach time or using the pool. Proximity to the main strip with shopping and restaurants was helpful. Aracelly was a great host. Between setting up transportation to and from the airport, day trips and activities and also provide it helpful tips we couldn’t ask for anything more. Our family just returned from a holiday in Costa Rica. We spent 10 days in Jaco at Vista Las Palmas (6B). We loved it! The condo itself is beautiful and very spacious and has everything you need. 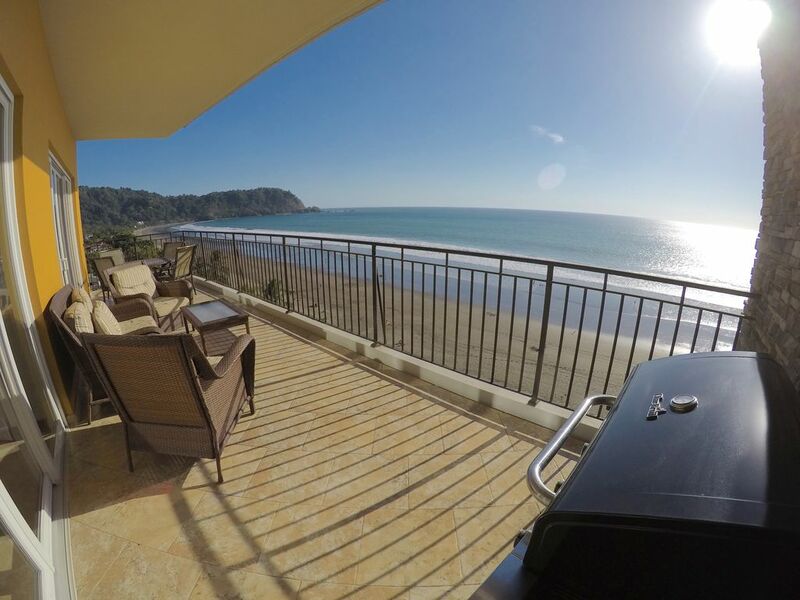 The view of the Pacific from the condo and balcony is spectacular! We had our coffee looking at the ocean every morning and watched beautiful sunsets. The infinity pool area with direct beach access is one of the nicest that we have experienced in many years of travels. This was our first time in Costa Rica so what really helped make our holiday special was having Aracelly to help us out. She lives right in Jaco so knows the area and can help plan and book activities/ tours/ transportation. She gave us lots of ideas so that we saw and did things we wouldn't have know about otherwise. She even took us on a hike overlooking the city to view the sunset! We highly recommend staying at this property and will definitely be back ourselves! This was our first time in Costa Rica. Aracelly was great through the whole process. She communicated well throughout the entire booking process, she was there for the check in process and showed us the condo and how to operate everything. She was very accomodating and there if you needed anything at all. The condo is great with a stunning view. We couldn't have asked for a nicer place to stay for our visit to Costa Rica. I would highly recommend!!! Thanks Aracelly for all that you did to make our stay perfect! Wonderful location plus great beach to relax. The lady who runs this condo is amazing always ready to help make your vacation perfect. Second time I have stayed at this location and I will be back. Thank you, keep up the great work! You are a true professional. Nice spacious condo right on the edge of one of the best beaches our group has ever been to. 3 couples enjoyed a week here and there was plenty of room for everyone. Condo is nicely appointed with 3 king sized bedrooms each with private full sized bath. Balcony was very spacious with plenty of room and furniture for the six of us. It faces west so you get to see the gorgeous sunsets over the ocean. Complex is gated and peaceful. pool is spacious and right at the entrance to the beach. Beach is very gradual going into the ocean so it makes it perfect to try your hand at surfing if you have the ambition. Plenty of boards to rent and instructors were available. 4 of us gave it a try and were surfing in about an hour. Pretty much everything was within walking distance so rental cars weren't necessary. Lots of nice restaurants very close. Aracelly was great, she set us up with transportation from and to San Jose Airport. She also arranged some tours for us and was very accommodating. We will definitely be back in the future!! The condo was top notch. You can’t beat being right on the beach. It’s also located around a lot of great restaurants and bars. Aracelly the property manager was very helpful also. She arranged transportation from the airport and activities for our group. We can’t wait to come back! Thank You Sam I hope you can come soon! Rates may be less if fewer bedrooms are required. Late booking and monthly rate discount available.